Courgettes are hardly anyone's favourite vegetable and yet there are few courgette haters. Reason being, of course, that it's a bland as anything a veg. It is all right raw but more often eaten cooked and the rub is, it cooks to a kind of gelatinous texture - or burns. The old trick to salt and rinse aubergines has long lost its validity as the modern varieties are hardly ever bitter. But hey! 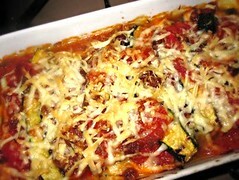 Do that to zucchini and there's a result - a much tastier vegetable. Simply slice or spiralise the courgettes, place in a colander and mix in a good quantity of sea salt. leave for at least 15 minutes. Rinse with cold water, squeeze as much moisture as you can and additionally pat dry in paper towels if you can be bothered. Ready to fry, sauté, bake or even eaten raw.